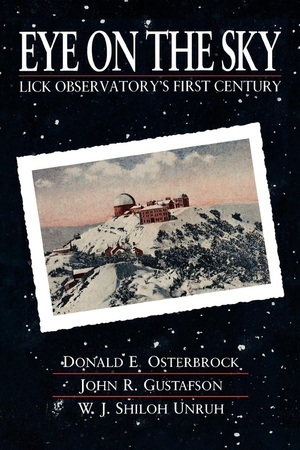 The world's first mountain-top observatory and America's first big-science research center, Lick Observatory exemplifies astronomy's dramatic development in the past century. A dedicated Confederate naval officer and his jack-of-all-trades foreman used the bequest of a miserly California eccentric to transform an isolated mountain peak into the world's premier research observatory. Its first staff included a director from West Point and three of the outstanding astronomers of their time. Since its dedication in 1888, Lick Observatory has been the site of many of the most important discoveries in astronomy. Eye on the Sky presents Lick Observatory from the point of view of the people who breathed life into its giant telescopes. Their community was both constant and constantly transformed, shaped by workers famous and unknown who made it their home. The authors also explain in terms anyone can understand the laboratory advances that were adapted to telescopes to make them more powerful, and the conceptual breakthroughs that discoveries at the telescope helped bring about. The men and women who went to the top of Mount Hamilton in search of greater knowledge of the skies helped to change our conception of the universe and our place in it . They were people with personal and political lives as well as scientific careers, and their story illuminates a time and a place where foundations were laid for the discoveries of the next century. Donald E. Osterbrock, Professor of Astronomy and Astrophysics at the University of California, Santa Cruz, is himself an astronomer in the Lick Observatory and directed it for eight years. He has published a book on the astrophysics of gaseous nebulae, as well as a biography of James E. Keeler, and is President-Elect of the American Astronomical Society.